If you’re thinking of buying your first critter, the Super Pet My First Home for Critters is the perfect choice. It’s the ultimate starter kit containing everything you need to bring your pet home successfully. Each cage is constructed from chew-proof coated wire with secure .5-inch spacing and stain-resistant plastic parts. You also get 2 Comfort Shelves, 2 Safety Ramps, food dish, and Comfort Wheel. The deep scatterless base removes easily for quick cleaning. The white wire top portion provides your pet with superb ventilation and you with easy viewing. Easy snap-together assembly with no tools required. Measures 12.5 x 24.5 x 24.5 inches. Ideal for degus, rats, sugar gliders, and other unusual critters. The deluxe my first home for critters provides great living space for unusual critters such as sugar gliders, degus and, of course, pet rats. 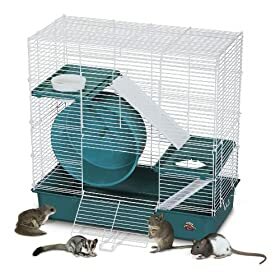 Comes complete with 2 comfort shelves, 2 safety ramps, food dish, and comfort wheel. Click here to Purchase!